Below you’ll find answers to frequently asked questions about our resort, Caalan Beach, El Nido and the Philippines! How far are you located from the town? We are a 15-minute walk from town. We pick you up via one of our special tricycles when you first arrive, and we can pick you up and drop you off at the Caalan Beach Alley during your stay before 10pm. Please note there isn’t great lighting on the path to town if you’re walking at night, however we feel very safe here and regularly make the walk with our young children using our cell phones as flashlights. Where does your boat leave for tours? Our boat is docked in front of our resort and our island-hopping tours depart from our resort at 9am each morning. We also obtain your ETDF form for you, saving you a trip to the tourism office. Do kids have to pay for tours? Children are charged the full rate as they are usually more work for guides than adults. What are your restaurant’s hours? Our restaurant is always open for breakfast from 7am-9am, but you have to special order for lunch and dinner. Our restaurant closes at 6pm. What countries do most of your guests visit from? Everywhere around the world! But the top three countries are Germany, France, and the UK (the largest expat population in El Nido is from France). In the past year we’ve also had guests from the US, Canada, Australia, New Zealand, Poland, Sweden, Switzerland, Norway, Denmark, Belgium, Italy, Spain, Portugal, Ireland, Holland, Greece, Czech Republic, Austria, Russia, Netherlands, Malta, Slovenia, Slovakia, Estonia, China, Korea, Japan, Vietnam, India, Bangladesh, Malaysia, Argentina, Brazil, Colombia, Chile, Israel, Iran, Bahrain, Tunisia, and South Africa! Is Caalan Beach accessible by tricycle? None of the resorts on Caalan Beach are accessible by the regular tricycles or vans in town. A narrow alley provides access to Caalan Beach, and we have 3 special tricycles that can do drop offs at the alley entrance. Can you swim at Caalan Beach? Most of Caalan Beach has a lot of coral so it isn’t great for swimming and relaxing, but it is awesome for exploring sea life. We’ve found crabs, sea urchins, octopus, starfish, sea cucumbers, sea slugs, and so much more. You will see locals collecting mussels, sea snails, and octopus in low tide daily. We have sand for lounging behind our seawall, and there is a very nice little beach 5 minutes further from our resort. There are also several inland beaches that we recommend (Corong Corong, Las Cabanas, Nacpan/Calitang, and Duli Beach). Why stay at Caalan Beach? Caalan Beach is away from the bustle of El Nido town. It’s a perfect spot for people who want to relax and enjoy peace and quiet, but if you’re looking to party, staying in town is probably the better option. Why is it so hard to get in touch with businesses in El Nido? El Nido is still a relatively remote destination and land lines are not available here. All businesses use cell phones and text is the main mode of communication. That means reception may not always be reliable, and sometimes it takes a long time for texts to come through. The internet also goes out from time to time, so sometimes there is a delay in responding to emails, and most businesses are accessing internet on smartphones and not computers. Is there electricity all day? Are there ATMs in El Nido? 2 ATMs were added to Municipal Hall in downtown El Nido in October 2015. But it is not always reliable as it is serviced regularly, there are brownouts, and it often runs out of cash on payday. Credit cards are also not accepted at most places, so please be sure to bring as much cash as you’ll need on the trip. You can read more about cash and credit cards in El Nido here. When is the best time of year to visit El Nido? 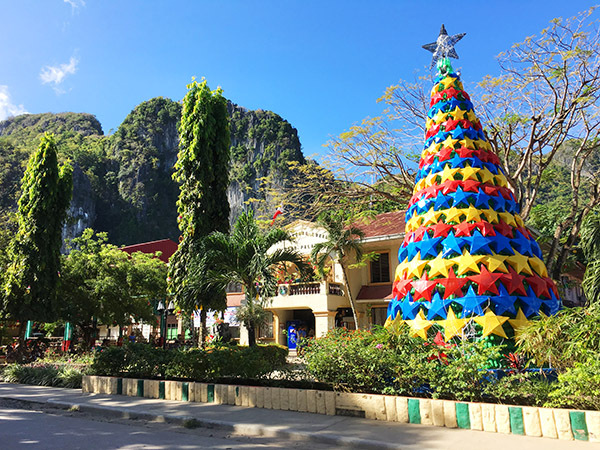 El Nido’s peak season is from December – May during the “dry season.” Though we experience warm, tropical weather year round, December – February are our coolest months while April and May are our warmest months. June – November is generally considered the “wet season” where we experience more rain, but there is typically plenty of sunshine and it’s a great time to take advantage of lower rates and less crowds. As residents we can say it’s a bit unpredictable, and you may not see any rain at all during your trip here in the wet season. El Nido’s location is also typically shielded from the heavier storms that can hit other parts of the Philippines. The absolute busiest times are Christmas-New Year’s, Lunar New Year and Easter so if you’re planning your trip around those times, plan ahead because the entire area books up completely. We do not recommend drinking tap water which is well water, so always purchased bottled or purified water. Is wifi readily available in town? Wifi is always available on our resort, but it is slower than high speed internet available in the US and Europe. Cafes in town typically have wifi, but you will not be able to access internet walking around town. If you need internet access at all times, we recommend buying a Globe Tattoo pocket wifi for 1500 pesos in the cell phone store across the street from Inggo or at Art Cafe. We’ve used this when our Smart internet has gone down, and the speed varies. Sometimes it’s so slow you can barely use it, or it’s only fast enough to check your email. In off peak times in the evening, it can be even faster than regular wifi. Because wifi is generally not too reliable throughout Palawan, we always have pocket wifi with us when we travel here. You can also purchase your own unlocked pocket wifi abroad (so you can put in a local sim card), which may be more powerful than what’s available to purchase in El Nido. Do I have to worry about mosquitoes? Some people get quite a few bites throughout their trip, and some get none at all (or rather they’re not allergic to bites). But mosquito bites typically do not itch for very long and as long as you have bug repellent on, they shouldn’t pose too much of a problem. What you should be aware of are nikniks (sand flies or no-see-ums), which tend to bite on the shores at dusk and dawn. We’ve written about it in more detail here. How do I treat mosquito bites? Bug Repellent Slap Bracelets – We use this for our kids and they seem to really help. Since we purchased them many more have come on the market we have yet to try. What are the must see/do things in El Nido? Island hopping is the star of El Nido where you’ll see the white sand beaches, crystal clear waters, and limestone karsts. Tours A and C are the most popular, but each tour is special in its own way, and all of them are guaranteed to be fun. We would also suggest a day at Nacpan or Duli Beach, and catch the sunset at Las Cabanas and Corong Corong. There is of course lots more to do depending on your interests – scuba diving, deep sea fishing, hiking, etc., but the 5 day itinerary mentioned above shows you our most popular must sees! Is El Nido family friendly? Absolutely! Filipinos love children, and they are welcome everywhere. We also have a crib to accommodate families with babies. Our kids have been coming here every year since they were 9 months and 2 years, and we moved here when they were 4 and 6. The only really questionable area in the Philippines is the island of Mindinao in the south, and for the most part they were isolated incidents. But El Nido/Palwan has one of the lowest crime rates, and it is very safe here. We have absolutely no qualms about walking home at night with young children. Why do some bathrooms only have a bucket of water? Some bathrooms like at the bus station at Puerto Princesa only have a bucket of water, a bidet, or a handheld sprayer and no toilet paper. Establishments that cater to tourists almost usually have toilet paper, but it never hurts to carry a little bit of toilet paper! Are there any hospitals in El Nido? There is a clinic as well as a private doctor that can treat minor injuries. The closest hospital is in TayTay, an hour away, but any serious injury must be treated in the island capital Puerto Princesa, 5 hours away. 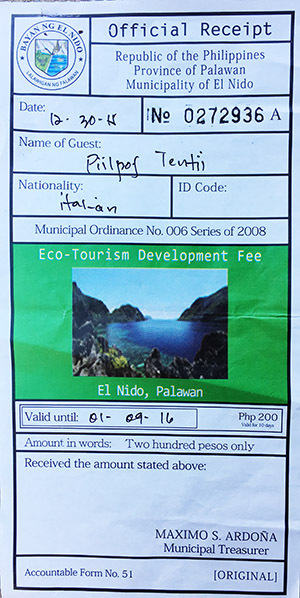 The ETDF stands for Eco-Tourism Development Fund and is designed to help limit the impact of tourism on the environment in El Nido. A 200 peso ETDF fee per person is required for island hopping. We can obtain this paper form for you, and it will be good for 10 days. What’s up with all the dogs? Dogs are generally free to roam around, and though they may seem like strays, most probably have owners. Because there are no spay/neuter services in El Nido however, they frequently breed. For the most part they are happy (if a bit hungry), friendly and used to people. They’re easy to shoo away if you don’t want them near, but they definitely appreciate a little bite to eat! Is there such a thing as island time? We have a packing checklist here! A first aid kit is always a good idea when traveling to a remote destination because medication can be hard to come by, and you may not be able to find brands you’re used to back home. Many countries do not need visas to visit the Philippines for up to 30 days. Please check with your local government to find out regulations for your country. Do I need vaccines to visit the Philippines? Officially specific vaccines are not required unless you enter from a country with a risk of yellow fever. You can check out the CDC’s vaccine recommendations here, which are very comprehensive. Before we moved to the Philippines from the United States, we got the typhoid vaccine (an oral vaccine through our regular doctor that is good for 5 years), and had already gotten the Hepatitis A vaccine for a previous trip to Costa Rica. We were also up to date on our tetanus vaccine. As residents we cannot take anti-malarials daily, but you can get a prescription from your doctor for them before your trip. Do I need to take any other health precautions? The New York Times has a great guide on general travel precautions here and traveler’s diarrhea (the most common problem travelers encounter) here. What is the time difference in El Nido? El Nido is GMT +8 which means it is currently 15 hours ahead of Los Angeles, 12 hours ahead of New York, 7 hours ahead of Paris, the same time as Taiwan, and 1 hour behind Seoul/Tokyo. English is an official language of the Philippines along with Tagalog, so many Filipinos speak English, especially those that work in the tourism industry. But if you’ll also be traveling to more remote areas, it definitely wouldn’t hurt to know a couple of key Tagalog words and phrases! Locals typically do not tip except to round up for taxi fare. However tourists typically tip and it may be expected by hotel bellhops, doormen, (Php 20-50) etc. Often restaurants and hotels will add a 10% service charge. We typically tip 10% at restaurants, and 50-100 pesos to anyone who is particularly helpful. Tips are not always expected, but always very appreciated. Is the Philippines gay friendly? According to Wikipedia, “The Philippines was recently ranked as one of the most gay friendly countries in the world, and the most gay friendly in Asia.” We are proud to be a gay friendly resort! Why does everyone call me sir or mom (mam)? Titles are very important in Filipino culture, and locals will all call you sir or ma’am (but it sounds like mom). They address Filipinos as kuya for men (which means big brother) and ate for women (which means big sister), whether they are older or younger. What is the Filipino culture like? Filipinos are extremely friendly and even though poverty is prevalent, they’re genuinely happy people. If they see someone that needs help, they will always stop. You will definitely feel welcome here and fall in love with the Philippines!